At the center of tropical Visayas is Mactan Island—our home—along with its satellite Olango chain of islands. What makes this cluster so well known around the world? Well, aside from being a national transportation, industrial, and commercial hub, Mactan also hosts many lovely tourist attractions. The vibrant reefs surrounding the island and the Olango Chain are some of the best scuba diving destinations in the country. 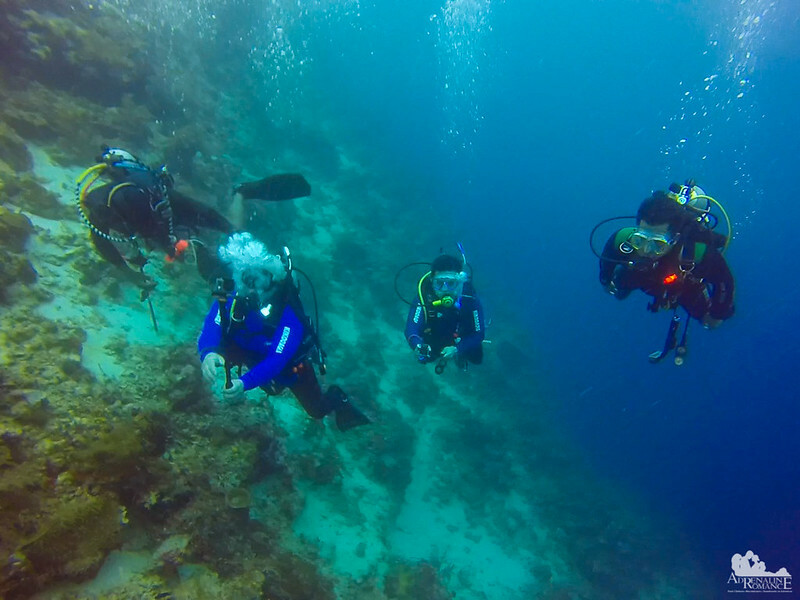 A friend of ours, Maxi, invited us to a weekend dive. We woke up early to an overcast, lightly rainy Sunday, which actually caused us a bit of trepidation. Not because of currents and waves—there was no wind, so rough seas were not a concern. 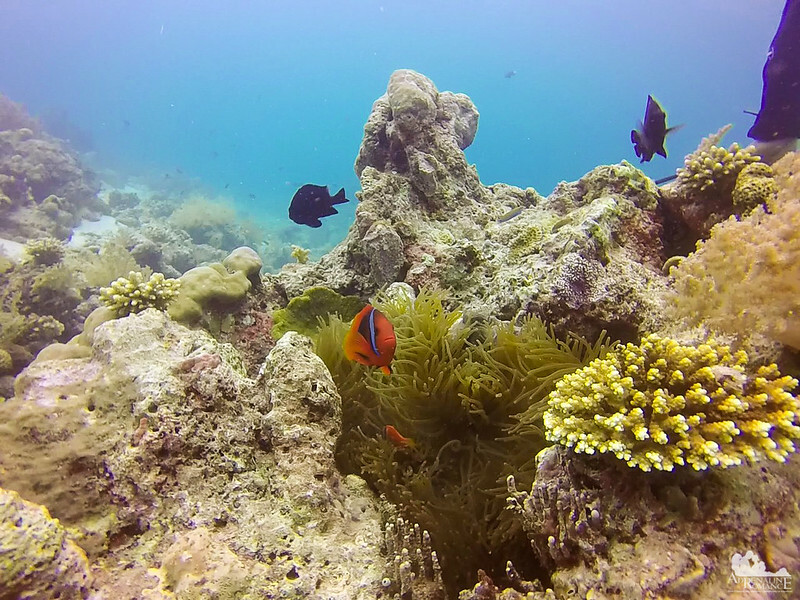 We feared that the gray day might mute the colors of our underwater photos. After meeting our friends Halourd, Dan Leo, Jho, and Maxi, we proceeded to Scuba Star Dive Services where we were warmly welcomed by the dive shop manager and CMAS M1 Instructor Rambo. 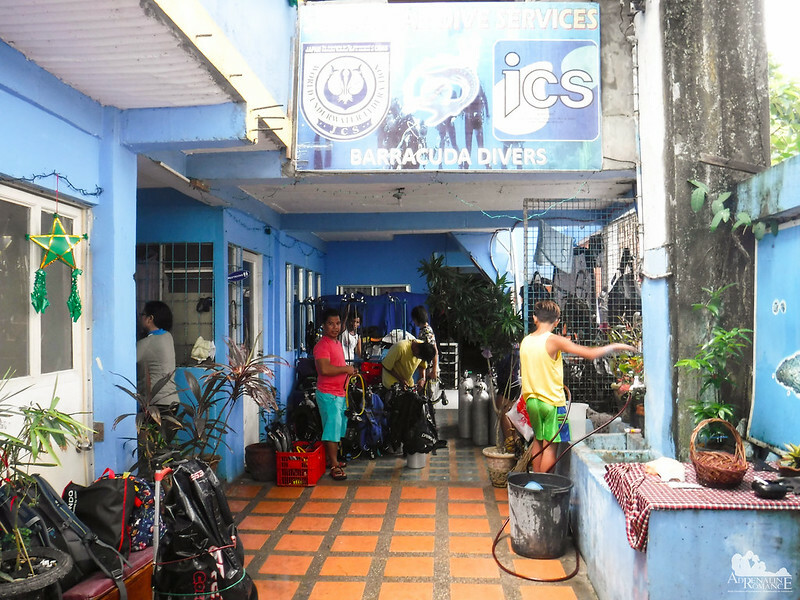 The family-run dive shop has been offering top-quality and reliable diving services for years. When we went inside their gate and experienced a smiling welcome, we knew we will have a great time. We were not the only ones who were diving. Maxi and his dad, and a group of young people who wanted to try out scuba diving for the first time joined us. The dive boat was anchored a few hundred yards from the shore, so we had to take a small raft to reach it. As you can see, excitement was in the air. But personally, my excitement was probably 10 times as high as everyone else there. That’s because I just acquired my very own complete set of brand-new Aquamundo scuba gear. This dive was its baptism of fire—err–water. The raft can only accommodate a limited number of people and gear, so it has to go back to pick up the others. While the raft was away, a couple of the first-timers had a DSD session with the CMAS dive guides who accompanied us. Later, the students revealed that they were totally exhilarated at the feeling of breathing underwater. 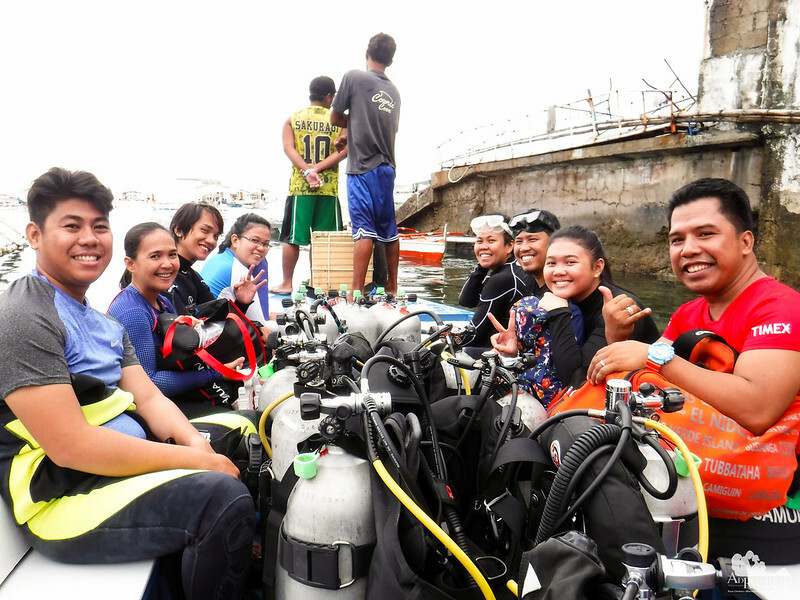 With the entire team in the boat, it was time to go to our first dive site, the San Vicente Marine Sanctuary in Olango Island. If you remember, a few months ago, we snorkeled at the shallow part of the sanctuary. Now, it’s time to check out its deeper sections. Although the weather was calm, it was uncharacteristically gloomy due to a tropical depression that hit the southwest part of the country. In fact, while we were under way, we could see an ominous thundercloud a few miles away. Although we were slightly disappointed because our photos won’t be as vibrant as we expect them to be, it was okay; the real scenery that we’ve come to witness is below the waves. We arrived at the edge of the sanctuary in more or less 15 minutes of boat travel. We geared up, had a dive briefing, performed required buddy checks, and jumped into the water. 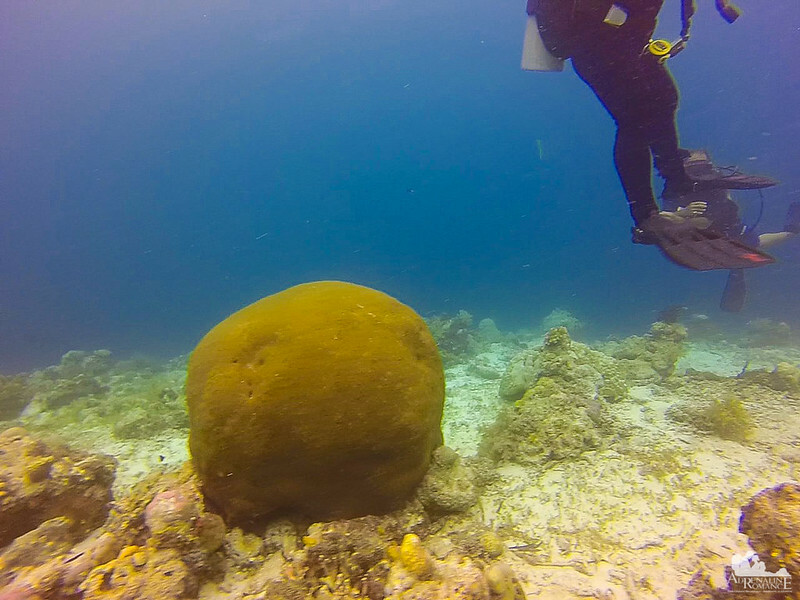 This humongous ball-like brain coral, which is half as tall as an average man, serves as the entry marker to the San Vicente Marine Sanctuary’s wall. Although the sea was pretty calm, we could definitely feel a slight current pushing us southward. 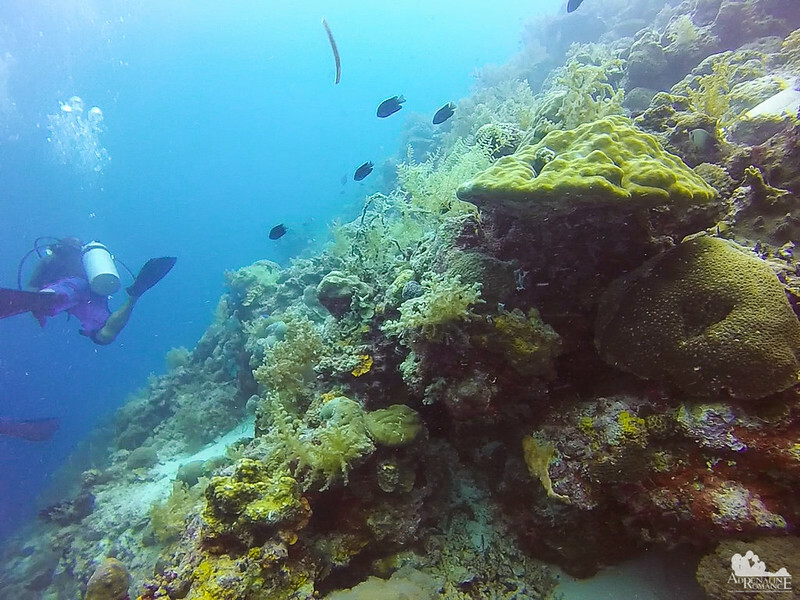 For us, this was one of the most favorable diving conditions. As long as we maintain neutral buoyancy, we could ride along with the current like astronauts, hovering over dazzling coral beds. We barely need to kick, which means a more relaxed and non-damaging dive. This is called drift diving, and it is one of PADI’s specialty courses which we plan to take in the future. 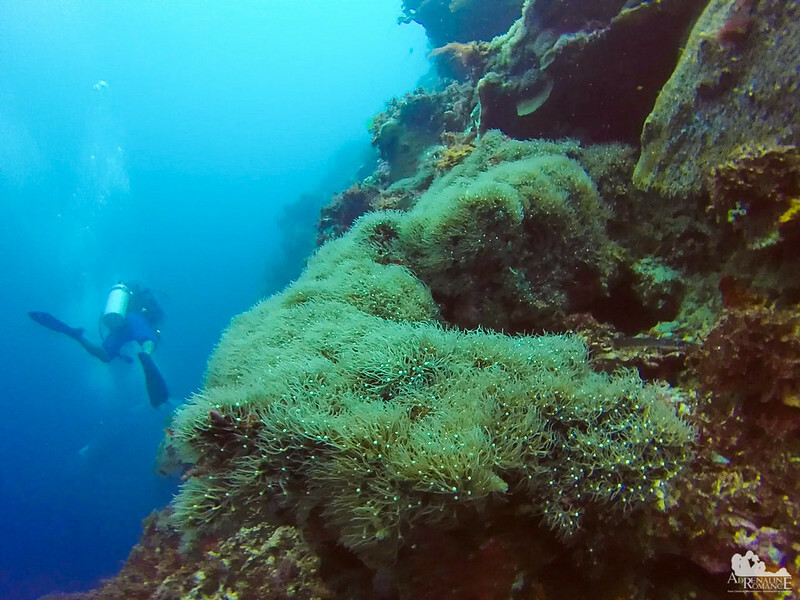 As we entered the wall, it was fully evident that the San Vicente Marine Sanctuary is recovering remarkably. This multi-layered table coral makes a great home for schools of damselfish, assessors, and other kinds of fish. 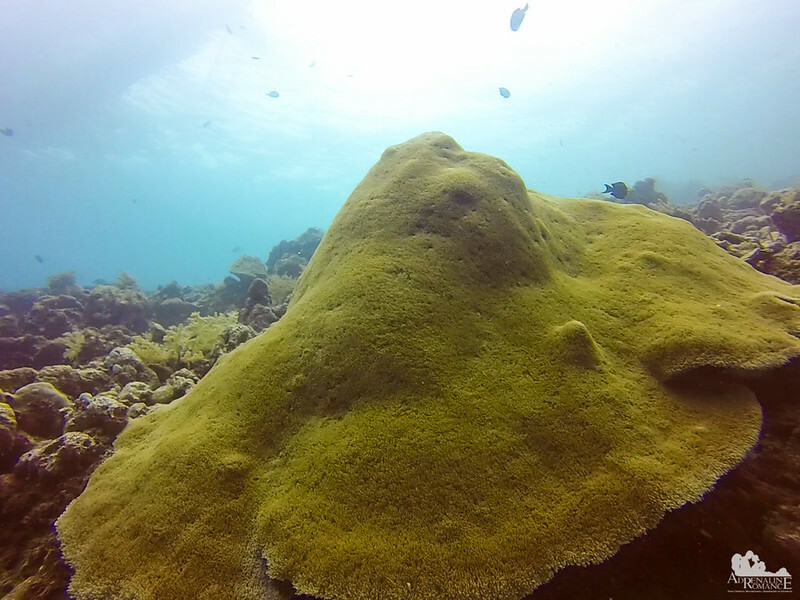 This massive hat-like leather coral looks like a piece of sunken island. We wonder what is under there. While the shallow area of the sanctuary looks relatively sparse and blanketed with sea weeds, the deeper areas are truly teeming with life. We are not sure if we’re right, but this may be a variant of black coral. Black corals are delicate hard corals that are now considered an endangered species. Note the healthy white polyps, the large sponge beside it, and the mass of crinoids on the coral’s branches. 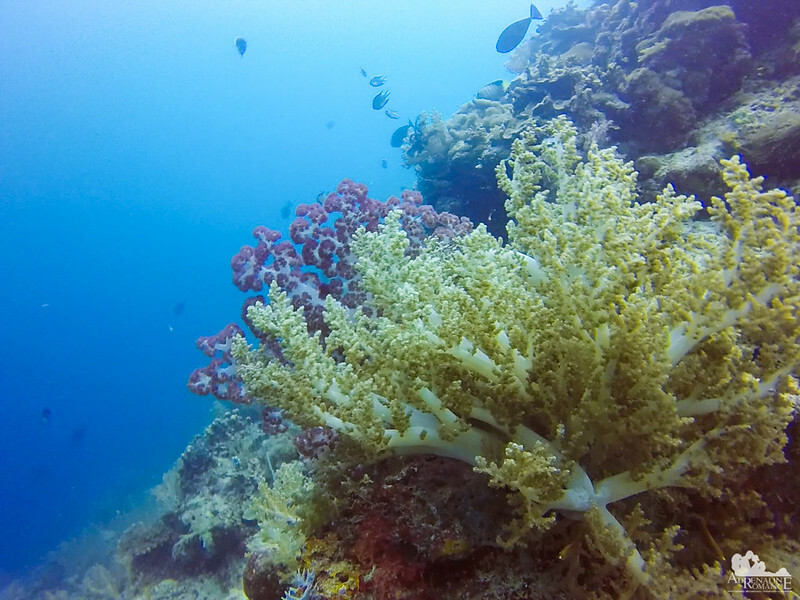 We also encountered expansive fields of soft corals, their polyps gently swaying along the slight current. 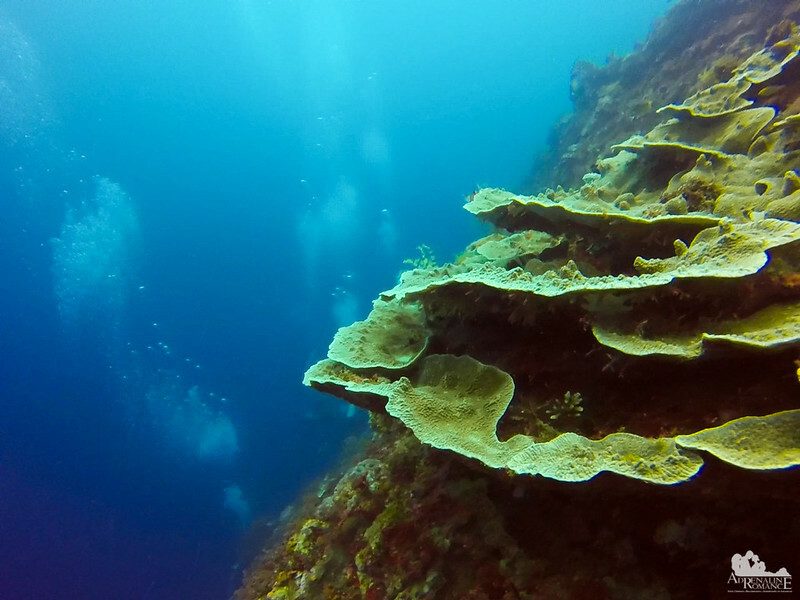 Above them are thick plate corals that vaguely look like tree canopies. 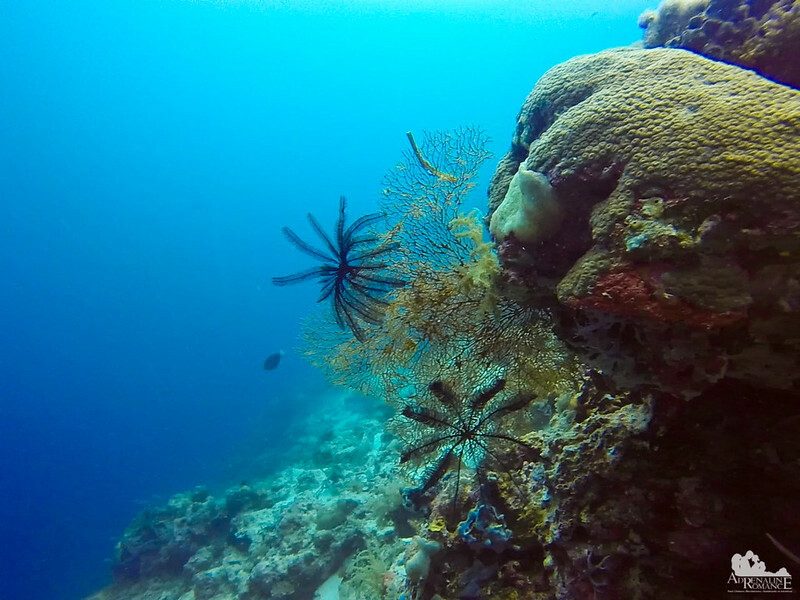 Delicate and stunningly beautiful sea fans seem to wave and say hello as we glided by. But we were extremely careful not to get too near. The slightest brush can break off those fragile branches, which could take years to regenerate. 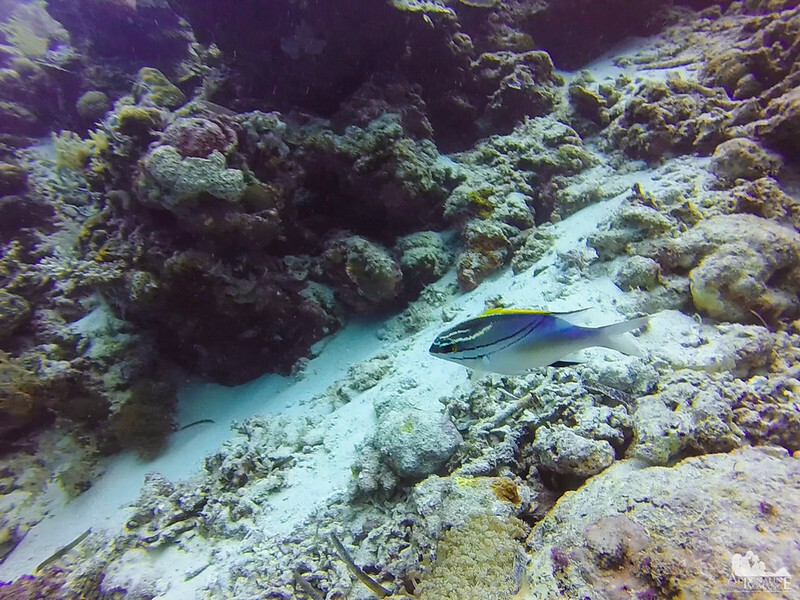 We also found this colorful fish who nervously kept an eye on us as we passed by his home. He was a big one, perhaps a foot long. Could anyone identify what kind of fish this is? We are guessing it’s fusilier. What a pretty creature! Soft Nephtheidae corals, or carnation corals, look like fascinating blossoms amidst the deep blue seascape. Coming in shades of yellows, purples, pinks, reds, and browns, they are some of the most attractive corals in a reef. Thus, they are quite popular among seawater aquarium enthusiasts. 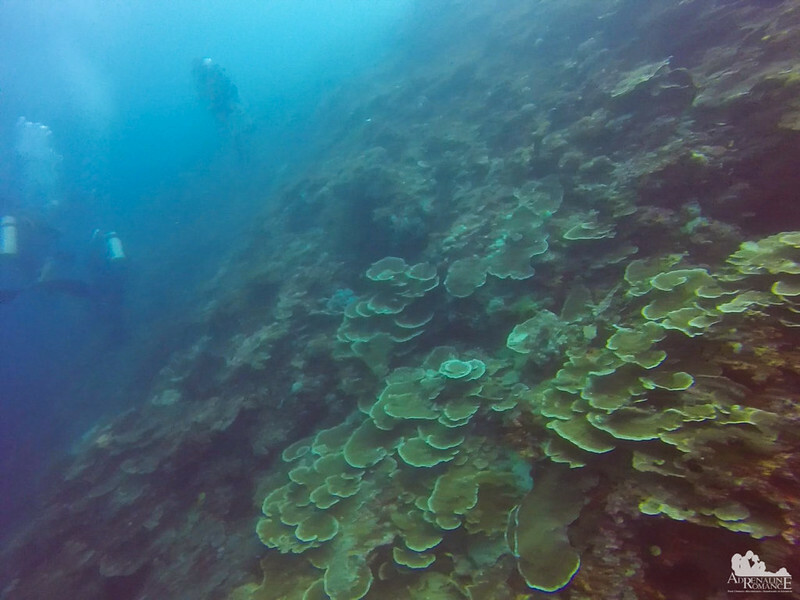 As we neared the surface for a safety stop, we came face-to-face with a large colony of Nephtheidae corals. 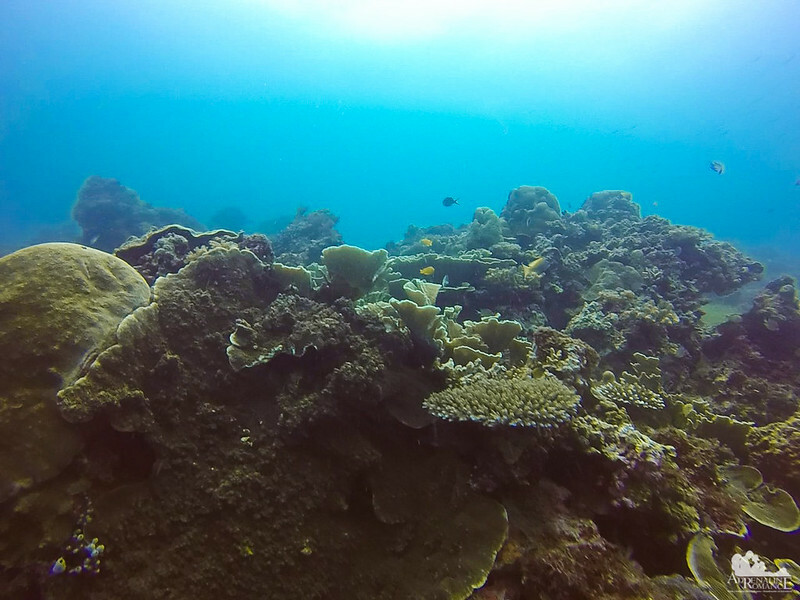 Soft corals like these live in nutrient-rich waters, which is why it is important to keep the sea in the San Vicente Marine Sanctuary free of pollution. They are important elements of a reef’s ecosystem since they provide excellent habitats for fish, algae, snails, and other marine creatures. Hard Agariciidae corals share the sanctuary with their softer counterparts. An interesting thing about this species is that they have a symbiotic relationship with xooxanthellae, a kind of algae that helps provide the corals with their energy needs. Of course, no dive is ever complete without the colorful anemone fish, or clownfish. Often mistaken as a friendly fish, this extremely territorial creature guards its anemone home with untold tenacity. We’ve even seen one attack a big green sea turtle when the latter ventured too close to its anemone. The black fish hovering nearby are domino damsels. Like the clownfish, they are immune to the stinging organelles or nematocysts of sea anemones. They also take shelter between the spines of diadema sea urchins. Everyone heard our tummies grumbling loudly as we boarded our dive boat. It was a characteristic feeling of emptiness. In other words, we were hungry! Hehehehe! 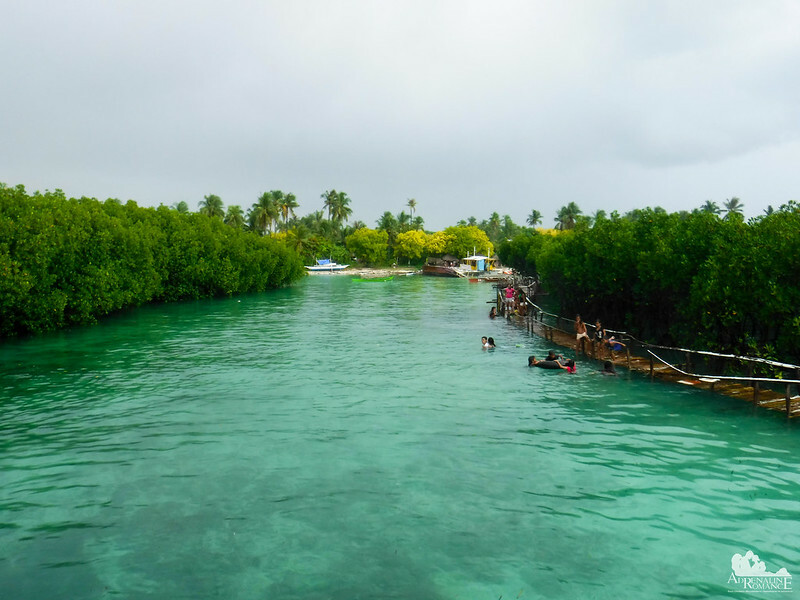 We headed to a humble restaurant situated in a small stretch of beach that is hidden behind a thick grove of mangroves. Note the clear, green water; the healthy mangroves help clean the water from pollutants. 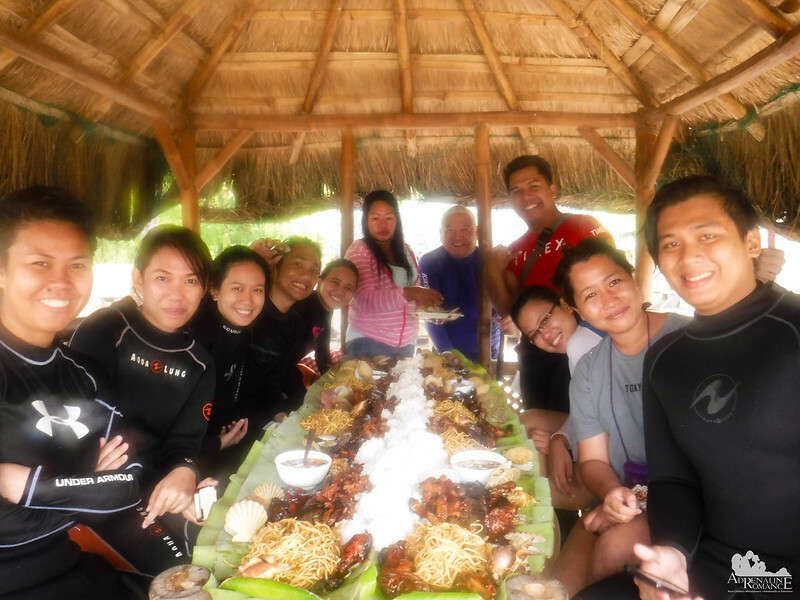 The aptly named Mangrove Seafood Restaurant served us a classic boodle fight. After we took this photo, everyone wrestled with the rice, adobong baboy, bam-i (rice noodles), and scallops. Yes, it was a free-for-all and a totally fun, Filipino way of sharing a meal. The delicious home-cooked lunch was prepared by Scuba Star Dive Services’ very own cooks. On our way back to the boat after our filling lunch, we spotted this fishing boat parked near the mangroves. 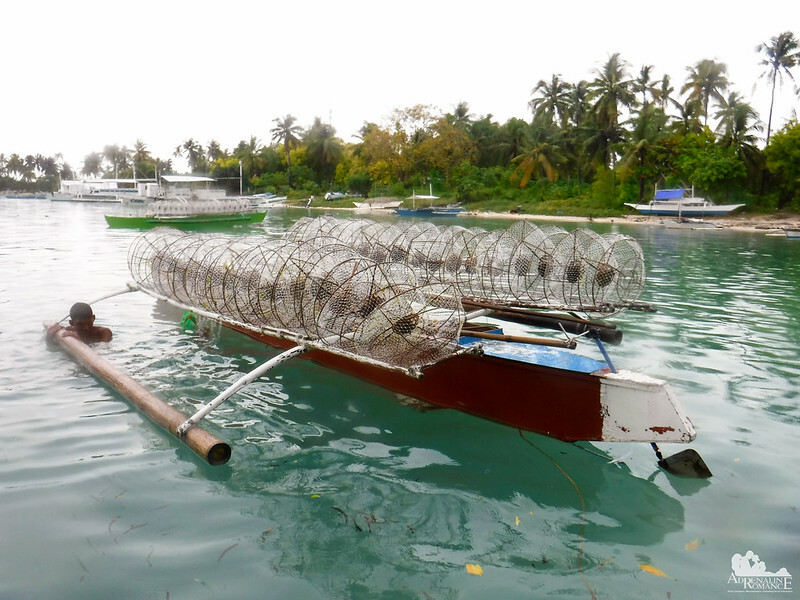 Locally called panggal, these ingenious traps are sunk at the bottom of a reef. They allow appropriately sized shrimp, crabs, and fish to go in so they could take a nibble of bait. However, once inside, they cannot get out of the trap. After a day or two, fishermen can then haul the panggals back to their boat with a fresh catch. Our second dive site is located in Mactan Island, specifically, just a few hundred yards from the shore of the old Tambuli Resort. There is something here that is very interesting to divers. 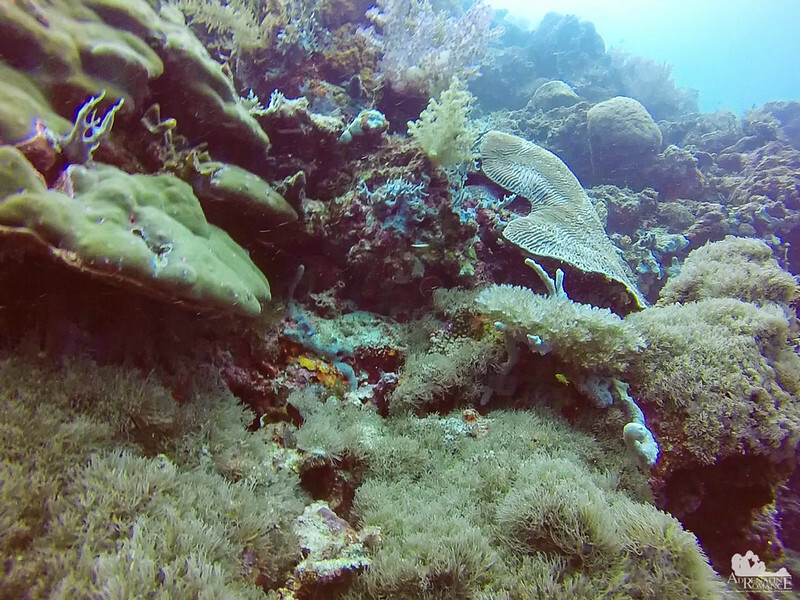 The first natural wonders we encountered were boulder star, porites compressa, and other kinds of hard corals. Various kinds of soft corals grow behind or on those stony ones. Expansive colonies of elephant ear and plate corals line up the wall. These stony corals are hermatypic corals, which means they are important reef builders. As they grow, they develop hard calcareous material for their skeletons. Their exoskeletons form the framework of the reef. This is why hard corals should never be harvested for jewelry or decoration. They are actually the pillars of a healthy reef system, and it’s sad to know that man’s greed for petty things takes precedence over the importance of preserving the foundations of marine life. Here are some more corals of the Agariciidae family. They look vaguely like rice terraces. At around 80 feet down, we encountered a carpet of green star polyps. They use their tentacles to ensnare bacteria and plankton from the water. Wow! 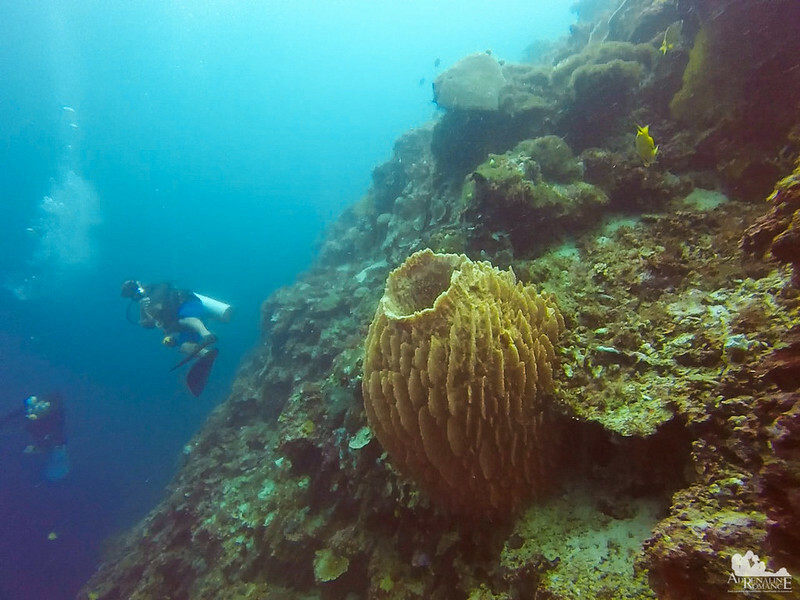 That is an oversized barrel sponge at 80 feet! It is aptly named the “redwood” of the reef due to its impressive size and long lifespan, usually estimated to be around hundreds or thousands of years. Its large size and firm texture makes the sponge an ideal dwelling place for small fish and shrimp. There must be something important within the thick plates of this large leaf coral because a large Moorish Idol (the yellow and black fish near the top of the coral) did not budge as we approached it. Its nest must be somewhere in the coral, and the Moorish Idol is not letting these strange bubble-emitting monsters harm its eggs. 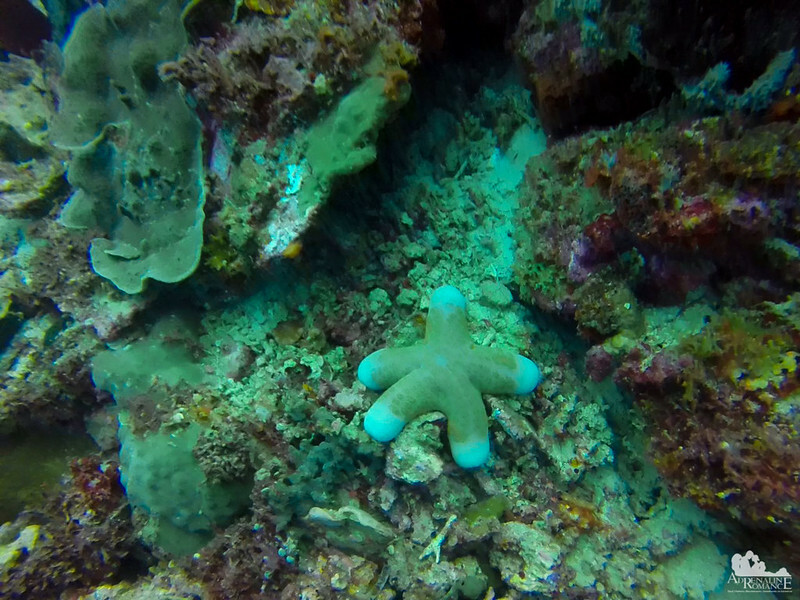 Heading to shallower water, we spotted this obese starfish. Starfish usually feed on bivalves, but getting its meal is not easy. You see, once a starfish catches an oyster, scallop, clam, or any bivalve, it grips the shell with thousands of tubular structures in its arms. The starfish then slowly but steadily pries the bivalve open. The battle could take hours, but eventually, the shell’s adductor muscle tires and gives in. Once the starfish feels a gap—that opening might only be a millimeter—it inserts its stomach to digest the soft tissues of the mollusk inside. A healthy reef system is important not only for the survival of marine life and preservation of a thriving marine system. Its importance extends to terrestrial life as well. Reef systems protect the coastline from waves and tropical storms, control the amount of nitrogen and carbon in the sea, and provide and recycle nutrients that are needed in all life on Earth. 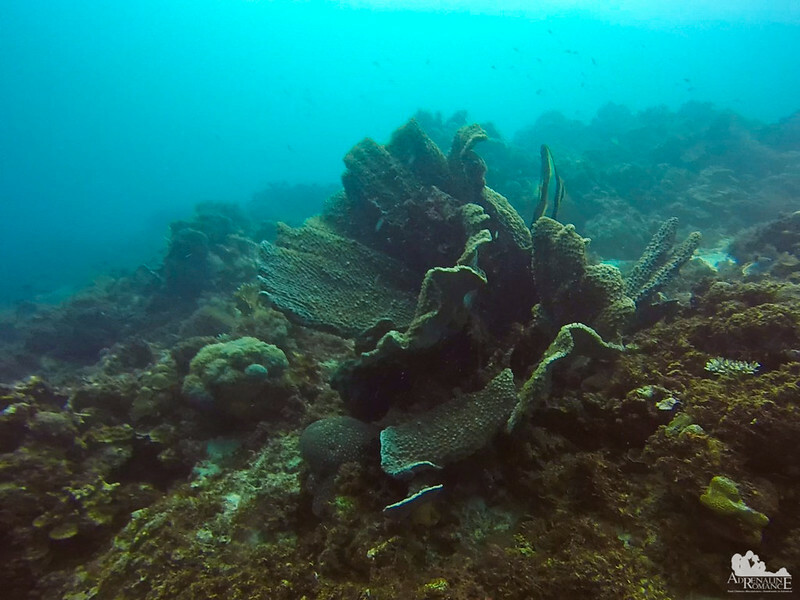 In addition, coral reefs are important to industries such as fishery, tourism, science, and even pharmaceuticals. As we ascended to 60 feet, we saw a dark something in the distance. As we neared the dark object, we suddenly let out a stream of bubbles. Bubbles of glee and excitement! 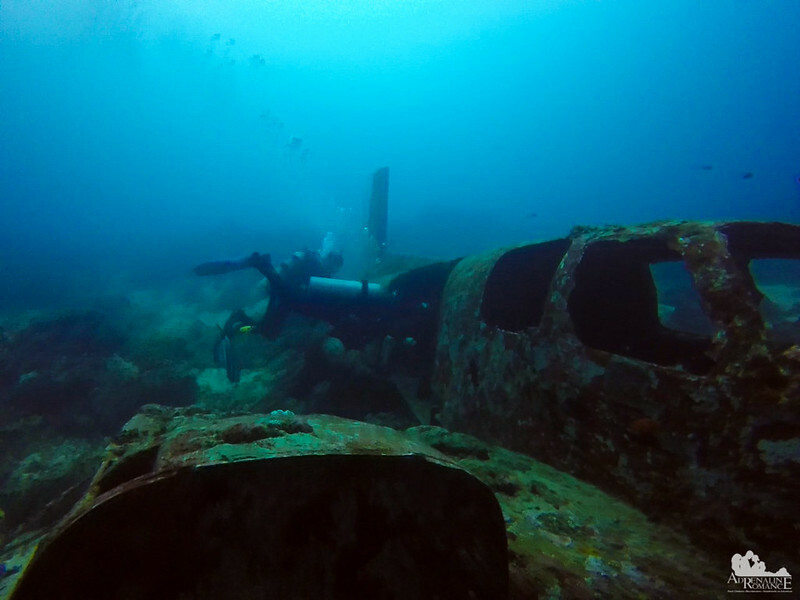 We finally reached the famed plane wreck of Tambuli, a popular local diving landmark. Did this aircraft tragically crash in the water? Nope. 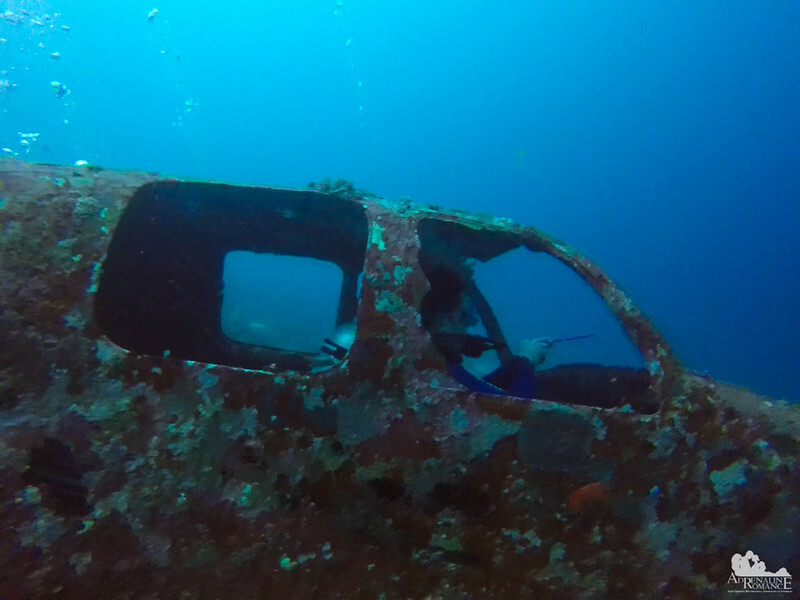 Originally owned by a local diver, this airplane was purposely sunk here several years ago to serve as an artificial reef. Now, fully encrusted with corals and sponges, the metal carcass has become a nice home for various denizens of the sea. Let’s go inside and visit their home, shall we? Sweetie and I have never been inside the cockpit of an airplane. 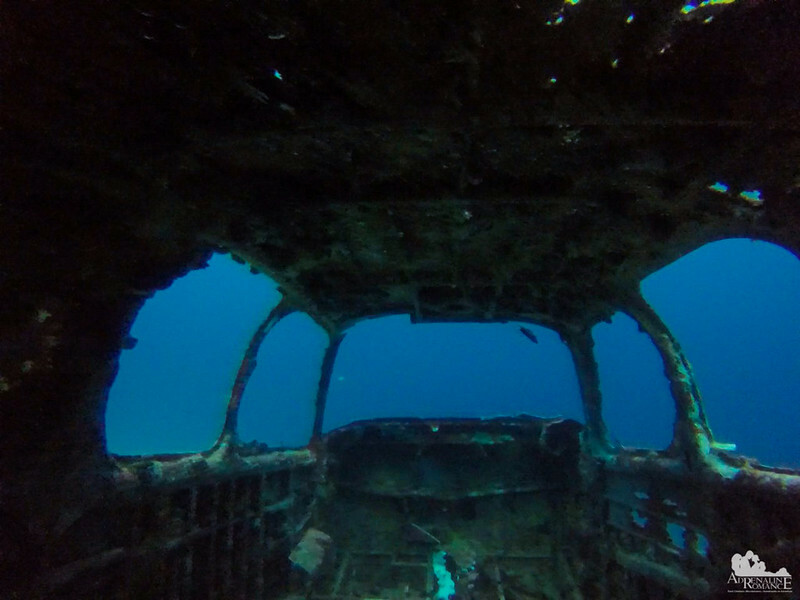 Although the instruments, seats, and all working features of this wreck are long gone, we were still very happy. So this is how it looks like. Quite a tight squeeze in there. Oh, someone is shooting down, well, imaginary enemy planes! Hehehe! We guess Maxi is a World War 2 enthusiast. With the air in our tanks running low, it was time to have a safety stop before we head to the surface. Obviously, Sweetie and I were ecstatic about our diving adventure for today. Now, we are planning to go for advanced certification so we could explore bigger wrecks! There are simply so many interesting things to see underwater that this blue world forever arouses our curiosity. 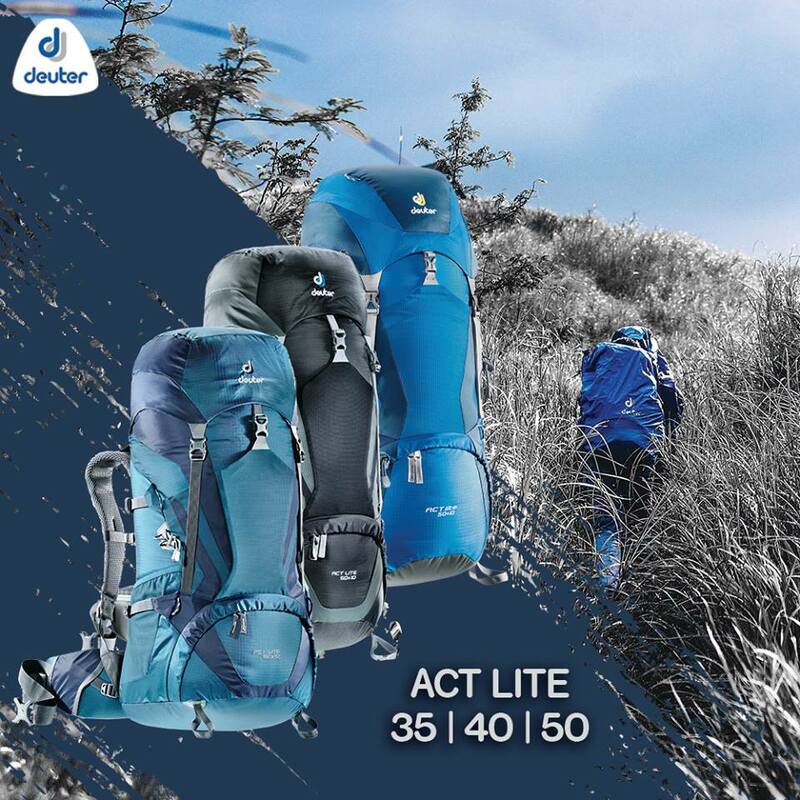 When it comes to high-action activities, it’s always best to show the action in videos. Here’s a short video of our adventure. Sorry for the muted colors, but the sky was not cooperating. We would like to thank Maxi Mino for inviting us over for this dive. Thank you too to Rambo and Scuba Star Dive Services for exceptional guideship. We enjoyed every minute of this Sunday adventure, including the meals! Lastly, we would like to welcome the scuba diving newbies who went with us in this trip. You have just made the first step into a beautiful, delicate, and concealed world. 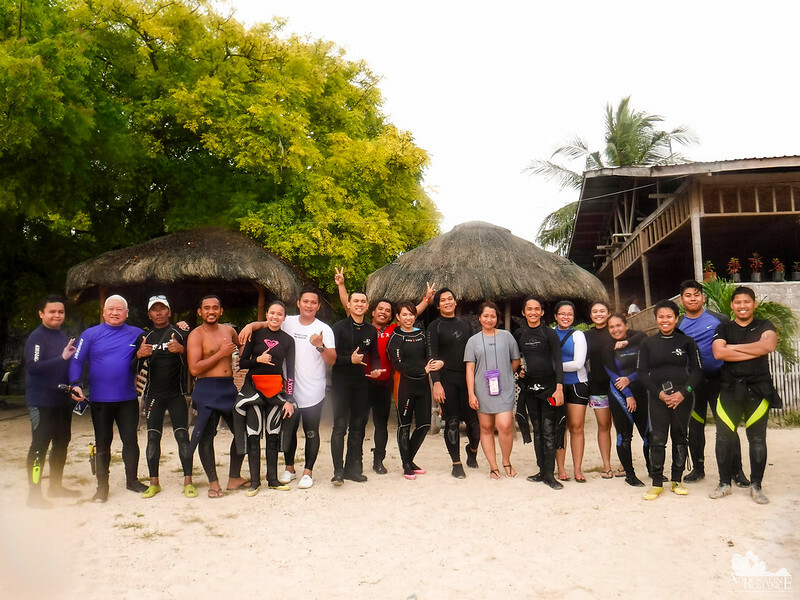 Hopefully, when you become full-fledged and licensed divers, you will realize the importance of protecting and preserving our marine resources for the survival of this planet. For your scuba diving adventures, get in touch with Scuba Star Dive Services using the following contact details. Contact Persons: Rambo, Analyn, or Linda. Scuba Star Dive Services also offers various certification courses. 1. 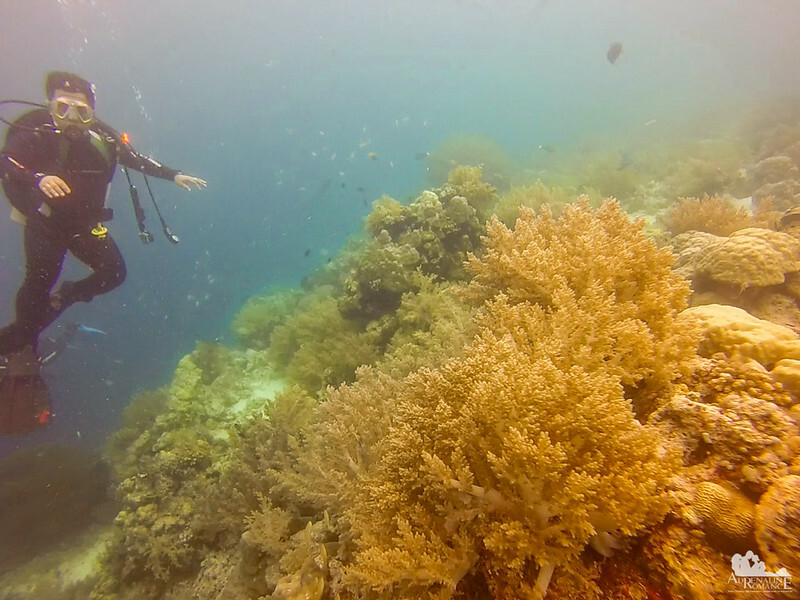 There are more than two dozen dive sites around Mactan and Olango islands. You can’t finish them all in one day! But don’t worry because Mactan has a lot of hotels, resorts, and other types of accommodation where you can stay. 2. For optimum visibility, it is best to dive in the morning when the sun is shining and at the right angle. In addition, there are usually fewer divers in the morning, so heavy siltation is not likely to obscure visibility. 3. 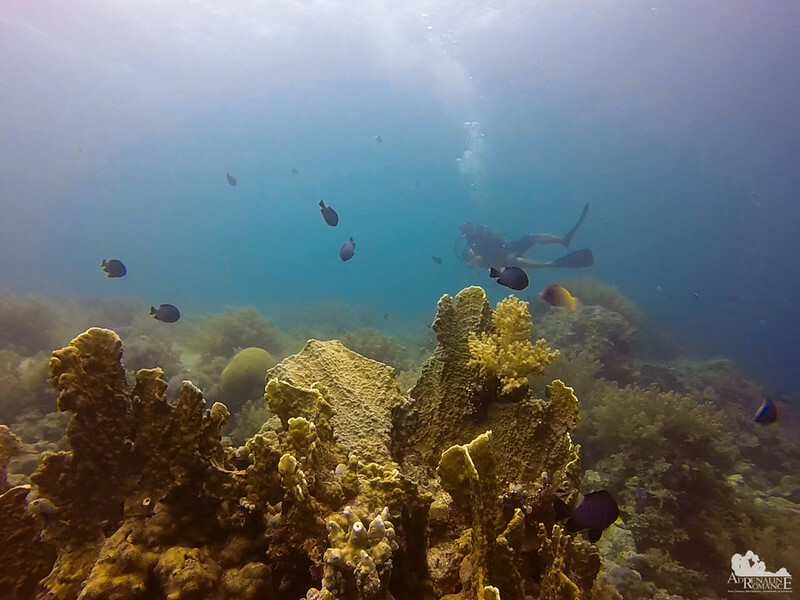 Several dive sites in Mactan and the Olango Chain have different conditions and characters. 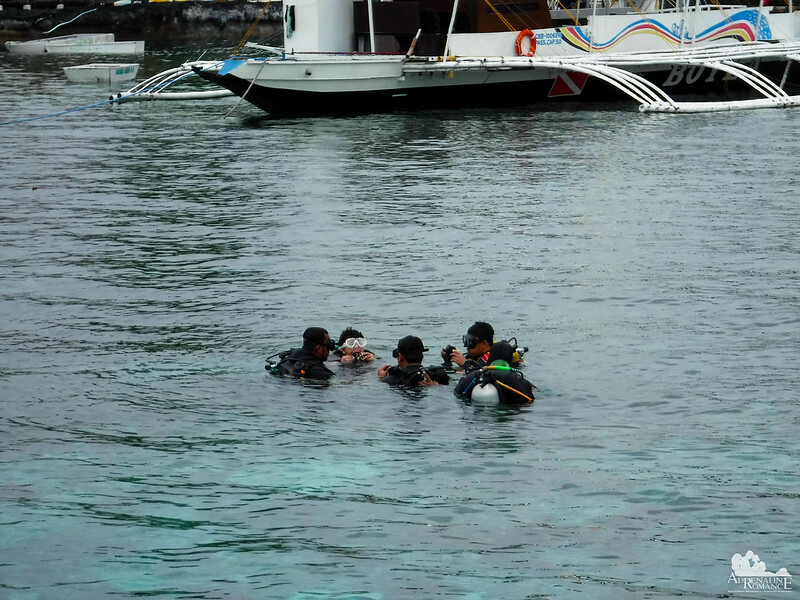 That means, some dive sites require a higher level of scuba diving experience and skill. Be sure to tell your Divemaster your skill level. 4. Establish neutral buoyancy as soon as you can to avoid touching the corals and seabed. Do not sit or touch the wreck. 6. Be a safe and responsible diver. Always observe the Leave No Trace principle. Never touch, disturb, tease, or collect marine wildlife. Remember we are in a protected area and an alien world that demands respect. It’s been awhile I haven’t scuba dive and after reading this post made me miss even more in exploring the depths of the ocean especially that airplane wreck dive. Anyway, you always have great adventures. Thanks for sharing. I really hope I can dive and get certification when I get home. I will be contacting you guys for more tips! 😉 See you soon! Oh yes, please do! It would be really fun to dive with you! Gian Carlo Jubela & Miss Sheila Mei — I dearly acknowledged & appreciate the Time & Effort you both put into this Blog. Humble to say, it surpasses the presentation of National Geographic or Discovery Channel (Considering the limited tools & materials you have on-hand) . Keep up the Good Work !!! Thank you so much for the kind words. We are trying our best to give our readers a great experience by telling our stories the best we can. And that includes photos. I don’t know where that funny photo icon came from, looks funny from GRAVATAR ?. Scuba diving seems like an excellent activity. So intense and beautiful! Wow! Very informative and you guys literally took me for a scuba dive 😉 Thanks for sharing your experience. Thank you very much for the compliment. 🙂 Please do dive here in Mactan/Olango Island if you have the chance to visit the Philippines. Oh, yes, the marine life in Mactan is really flourishing, especially now that people have become more environmentally conscious. The San Vicente Marine Sanctuary, for example, is recovering excellently. I am happy to see healthy marine life next to Mactan! 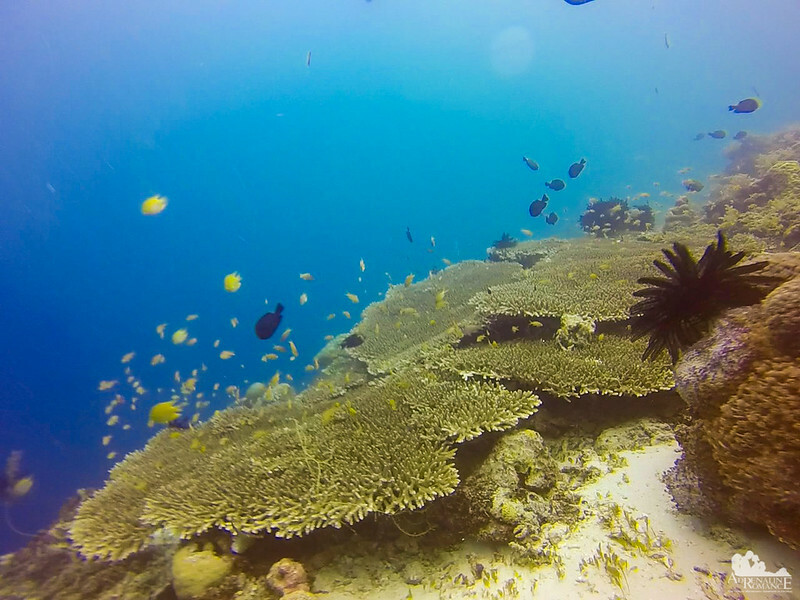 The reef looks so lively with such diverse marine life. 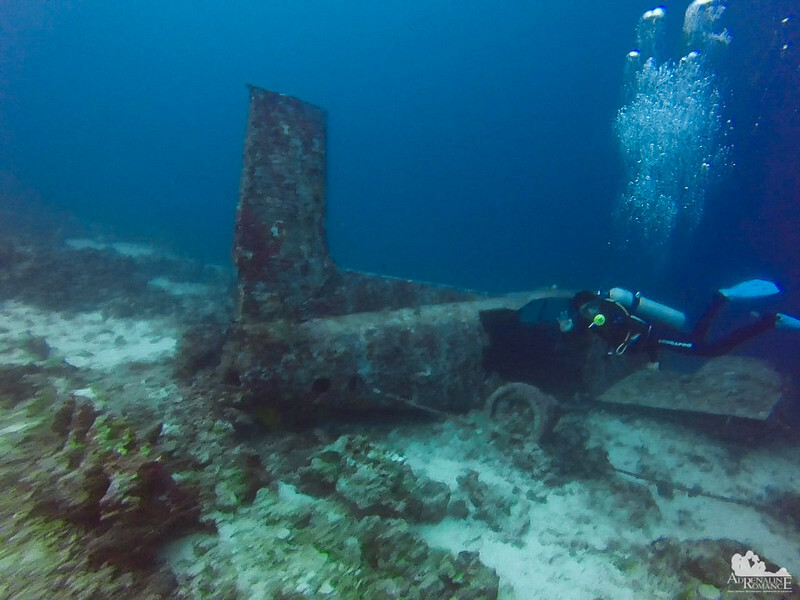 I really loved the idea of dropping an aircraft to create an artificial reef. I m really glad the corals and sea life have made it their home. This post brought back many fond memories from my diving trip to Lakhsdweep. Thank you for the kind words. It’s a really good thing that our reefs and marine sanctuaries are healthy. 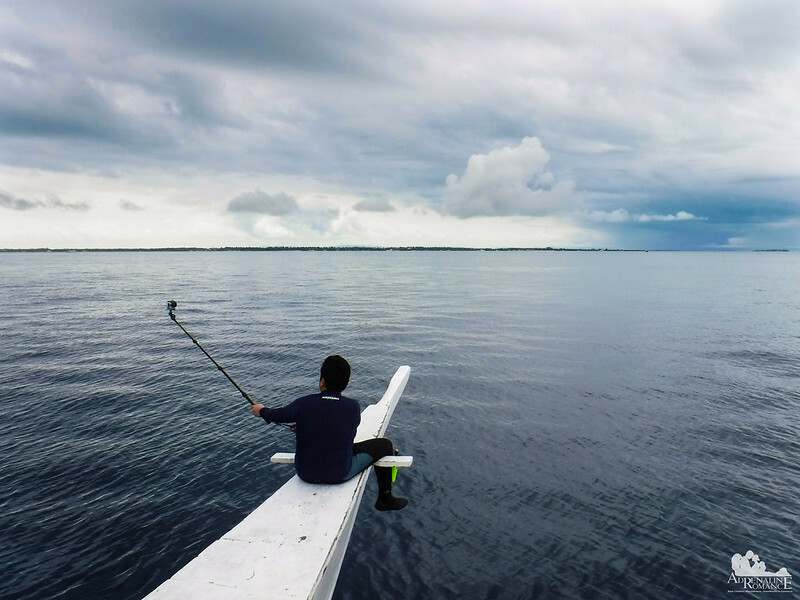 That is despite the fact that Mactan and Olango are densely populated, highly urbanized islands and that the channel between the islands is a shipping lane. Thanks for the post, i’ve actually considered taking lessons this year, then trying my hand at diving in Indonesia / Philippines next year. That’s cool! We suggest you enroll in a DSD (Discover Scuba Diving) session first before going for full certification. 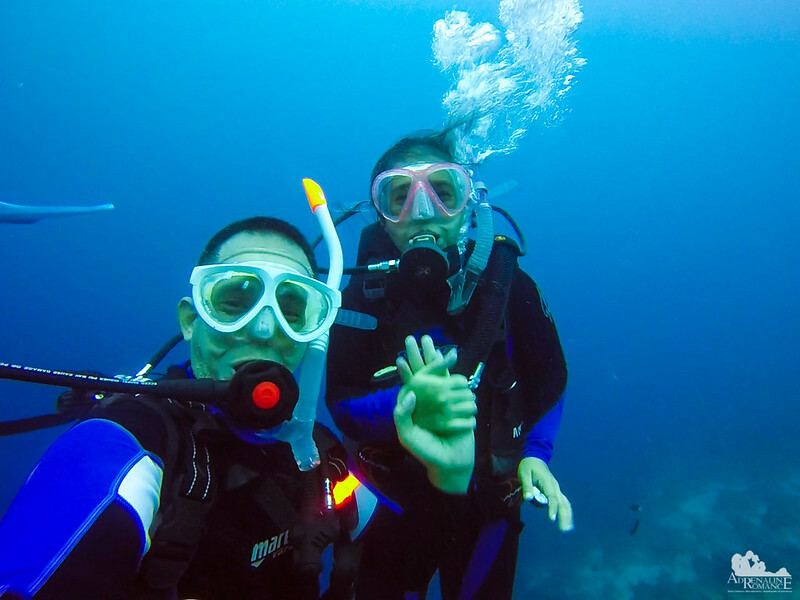 The DSD will help you decide whether scuba diving is really for you. In that way, you don’t waste your money—certification is expensive. thanks! i will definitely look into in in Barcelona. Wow! This is incredible! I didn’t know about Black corals. Thanks for the information. This is awesome to be able to see so many varieties in one place. I’ve not yet done my first dive, hoping to do soon!!! The pictures are gorgeous, hope you had a wonderful trip, The place looks absolutely ideal for diving. Hope you had a great underwater experience. The underwater world is so fascinating and colourful. That is an amazing colorful world there… I definitely am game to do this. Though I am pretty bad at identifying what I see. 🙂 I love thecombination of nature and wrecks here and that is my main draw. Loved your underwater capture too. This is stunning. I love Scuba diving and I remember my very first dive as well. The reef looks brilliant here. Would love to dive at this site. 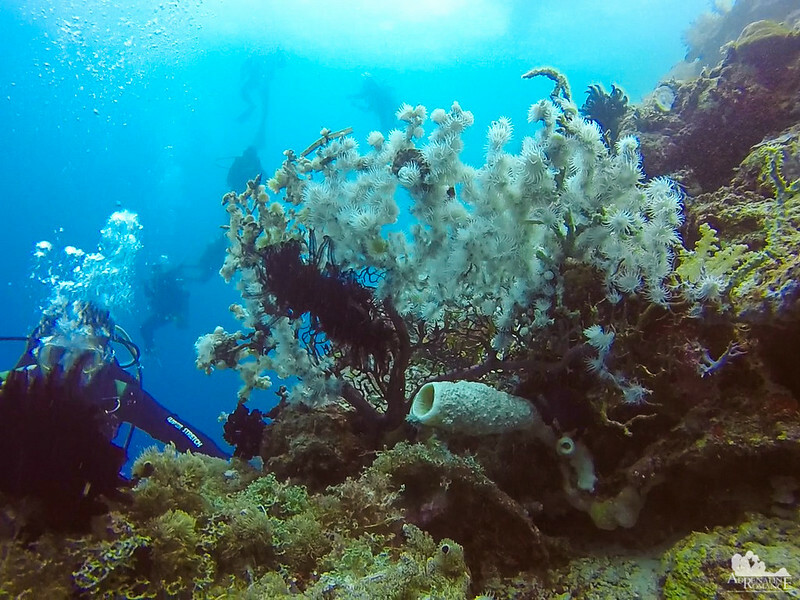 Yup, Mactan and Olango are some of the nicest dive sites in the country. Check them out if you have the chance to visit the Philippines. I’m sadly afraid of swimming and the water, but when I read posts like this I get so sad and a little jealous because the sorts of things you see scuba diving are just incredible! Would you believe that Sheila doesn’t know how to swim? You don’t need to be afraid; with scuba gear, you can breathe underwater. Then there’s a divemaster who will always be with you. Do try scuba diving; it’s a great adventure. Thank you for sharing such in depth material. It really looks like you enjoyed the dive. I have only snorkeled and I don’t know if I would be brave enough to dive and trust I won’t get eaten. The deep blue sea sure has a lot of beauty to it. You’re welcome, and thank you for the compliment. Like you, we had our fears when we first started scuba diving. But with more dives (and with a certification), the blue world became fascinating rather than dangerous.